At orgtheory, we’ve had on-going discussions about how to undertake research. For example, I’ve shared my own take on dealing with the IRB, gaining access to organizations, undertaking ethnography , timing and pacing research, writing for wider audiences, and what is ethnography good for? Guest blogger Ellen Berrey elaborated her thoughts on how to get access to organizations, and we’ve had at least three discussions about the challenges of anonymizing names and identities of persons and organizations, including guest blogger Victor Tan Chen’s post, guest blogger Ellen Berrey’s post, and Fabio’s most recent post here. Looking for more viewpoints about how to undertake organizational research? Preparing a research proposal? Need a new guide for a methods or organizations class? Rod Kramer and Kim Elsbach have co-edited the Handbook of Qualitative Organizational Research Innovative Pathways and Methods (2015, Routledge). There were several sources of inspiration that motivated this volume. First and foremost was a thoughtful and provocative article by Jean Bartunek, Sara Rynes, and Duane Ireland that appeared in the Academy of Management Journal in 2006. This article published a list of the 17 most interesting organizational papers published in the last 100 years. These papers were identified by Academy of Management Journal board members—all of whom are leading organizational scholars cognizant of the best work being done in their respective areas. A total of 67 board members nominated 160 articles as exceptionally interesting; those articles that received two or more nominations were deemed the most interesting. Of these exceptional articles, 12 (71%) involved qualitative methods. This result strongly mirrors our own experience as organizational researchers. Although both of us have used a variety of methods in our organizational research (ranging from experimental lab studies and surveys to computer-based, agent simulations), our favorite studies by far have been our qualitative studies (including those we have done together). One of the qualities we have come to most appreciate, even cherish, about qualitative research is the sense of discovery and the opportunity for genuine intellectual surprise. Rather than merely seeking to confirm a preordained hypothesis or “nail down” an extrapolation drawn from the extant literature, our inductive studies, we found, invariably opened up exciting, unexpected intellectual doors and pointed us toward fruitful empirical paths for further investigation. In short, if life is largely all about the journey rather than destination, as the adage asserts, we’ve found qualitative research most often gave us a road we wanted to follow. navigating the academic pipeline: swim forth or swim out? Like Fabio in his Grad Skool Rulz book, the co-authors Rachel Connelly and Kristen Ghodsee have a brutal and blunt chapter (“Know Thyself, part 1”) urging those unsure about academia to understand the limits of the academic job market, such as being expected to move where the jobs are and facing continual rejection. They warn that applicants should expect to spend between 3 to 5 years on the job market and that any job prospect might become THE job. One especially illuminating section addresses how some job applicants may take positions at particular kinds of institutions, assuming that these allow for a work-family balance, without understanding that other institutions may have the resources better suited to support working parents. Although the authors don’t go into this in great detail, some employers are prepared to dole out substantial resources to faculty – funds that can cover all of conference travel expenses, a book allowance, a guaranteed spot in a desired school for a child, subsidized housing in a good school district, college tuition payments for children, etc. – that other employers cannot. The book excels in revealing strategies used by academic parents to manage the limitless demands of academia and parenting. The one quibble that I have concerns a section where the authors offer a composite case of a “good student” who embarks upon an academic career as a default. The hypothetical academic struggles with the everyday challenges of academia and parenting; she eventually resigns from her tenure-track position to stay at home to raise children, supported by a husband who agrees to be the bread-winner for the family. Using this case, the authors invite readers to assess whether they truly enjoy “the life of the mind,” which include self-managing an academic career where deadlines can be postponed up until a point. The authors urge readers not to opt out of the pipeline in the way that the composite case’s academic does. They want readers to examine their “motivation” for considering an academic career. While the authors’ advice adopts a realist perspective, as we know from Herbert Simon’s work on decision-making, people often don’t know what their preferences are (or fully understand the consequences associated with certain choices), until they try them. My added suggestion is that students and tenure-track faculty try cultivating certain habits – namely, formulating research questions, writing regularly, and meeting publication deadlines – as early as possible. * If these don’t jibe, move onto other career paths. * As an analogy, read Dan Chambliss’s “The Mandanity Mundanity of Excellence” article about swimmers. Please join us in welcoming sociologist Ellen Berrey, who will be guest blogging about her hot-off-the-press book The Enigma of Diversity: The Language of Diversity and the Limits of Racial Justice (2015, University of Chicago Press). Diversity these days is a hallowed American value, widely shared and honored. That’s a remarkable change from the Civil Rights era—but does this public commitment to diversity constitute a civil rights victory? What does diversity mean in contemporary America, and what are the effects of efforts to support it? Ellen Berrey digs deep into those questions in The Enigma of Diversity: The Language of Race and the Limits of Racial Justice (University of Chicago Press, May 2015). Drawing on six years of fieldwork and historical sources dating back to the 1950s, and making extensive use of three case studies from widely varying arenas—affirmative action in the University of Michigan’s admissions program, housing redevelopment in Chicago’s Rogers Park neighborhood, and the workings of the human resources department at a Fortune 500 company—Berrey explores the complicated, contradictory, and even troubling meanings and uses of diversity as it is invoked by different groups for different, often symbolic ends. In each case, diversity affirms inclusiveness, especially in the most coveted jobs and colleges, yet it resists fundamental change in the practices and cultures that are the foundation of social inequality. Berrey shows how this has led racial progress itself to be reimagined, transformed from a legal fight for fundamental rights to a celebration of the competitive advantages afforded by cultural differences. Powerfully argued and surprising in its conclusions, The Enigma of Diversity reveals the true cost of the public embrace of diversity: the taming of demands for racial justice. Berrey’s other publications on this and related topics are available here. Looking for insight into the informal economy, the relationship between a lack of jobs and criminal activity, or ethnographic methods? UToronto sociologist (and CCNY and Graduate Center sociology alum!) Randol Contreras has agreed to do a virtual question and answer session here, at orgtheory, about his book The Stick Up Kids: Race, Drugs, Violence, and the American Dream (University of California Press 2013). Read the book (ch. 1 excerpt is available here). Check back with orgtheory to post your questions during the week of April 6! Randol Contreras came of age in the South Bronx during the 1980s, a time when the community was devastated by cuts in social services, a rise in arson and abandonment, and the rise of crack-cocaine. For this riveting book, he returns to the South Bronx with a sociological eye and provides an unprecedented insider’s look at the workings of a group of Dominican drug robbers. Known on the streets as “Stickup Kids,” these men raided and brutally tortured drug dealers storing large amounts of heroin, cocaine, marijuana, and cash. As a participant observer, Randol Contreras offers both a personal and theoretical account for the rise of the Stickup Kids and their violence. He mainly focuses on the lives of neighborhood friends, who went from being crack dealers to drug robbers once their lucrative crack market opportunities disappeared. The result is a stunning, vivid, on-the-ground ethnographic description of a drug robbery’s violence, the drug market high life, the criminal life course, and the eventual pain and suffering experienced by the casualties of the Crack Era. 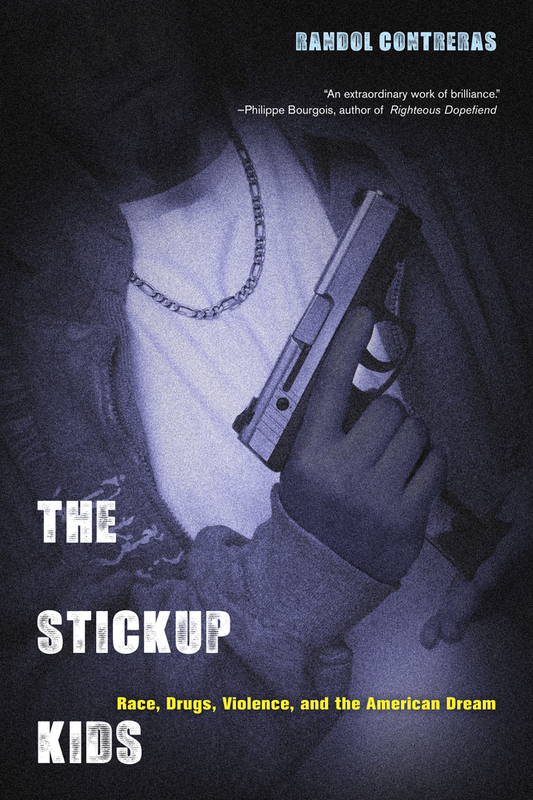 Provocative and eye-opening, The Stickup Kids urges us to explore the ravages of the drug trade through weaving history, biography, social structure, and drug market forces. It offers a revelatory explanation for drug market violence by masterfully uncovering the hidden social forces that produce violent and self-destructive individuals. Part memoir, part penetrating analysis, this book is engaging, personal, deeply informed, and entirely absorbing. how much publicity work should book authors do? A colleague emailed me to ask whether I thought hiring a PR specialist would be helpful for getting the word out about a forthcoming university press book. While a university press will send books to venues at the author’s request and place ads in academic venues like the Chronicle of Higher Ed, the author may consider doing more, usually using his/her own resources. Looking at the book publicist’s webpage, buying this person’s services would mean access to radio talk shows. At one end, one colleague thought that the “work should stand on its own.” While it’s possible that an audience will flock to an unpublicized book, not doing anything to announce the arrival of a book could effectively consign years of work to the remainders shelf of a bookstore basement or warehouse. At another end, a few colleagues might go on the radio talk show circuit, give talks at universities, book stores, and other venues, do interviews with high profile magazines (possibly in exchange for a pricy ad placed), and have ads on public transit stations. The trade-off here is emotional energy expended and the opportunity cost of working on other projects, spending time with family/friends, etc. Colleagues have also noted that depending on a professional association’s rules, authors can self-nominate books for section or professional association awards. Is it worth a couple $K to hire someone to do publicity? What tangibles and intangibles does an author get with this extra effort? Please do share in the comments. From the ethnographer’s curse, therefore, I turn to the ethnographic fallacies that limited my vision of market fundamentalism. First, there are three traps that await the ethnographer who seeks to comprehend the world beyond the field site: the fallacies of ignoring, reifying and homogenizing that world. Second, there are three traps awaiting the ethnographer who fails to give the field site a dynamic of its own: the fallacies of viewing the field site as eternal or, when the past is examined, the danger of treating the present as a point of arrival rather than also as a point of departure; and finally the danger of wishful thinking, projecting one’s own hopes onto the actors we study. I describe these six fallacies not to indict ethnography but to improve its practice, to help ethnographers grapple with the limitations of their method. No method is without fallacies, it is a matter of how honestly and openly we approach them. Being accountable to the people we study requires us to recognize our fallibility and, thus, to wrestle with that fallibility. The methodological dogmatists, who declare they have found the flawless method and spend their time condemning others for not following the golden trail, are the real menace to our profession. a bargain for $29,150.92 (plus $3.99 shipping)? While following up on an inquiry about the list price for my book Enabling Creative Chaos: The Organization Behind the Burning Man on amazon, I was surprised to see that at least one vendor has apparently entered an algorithmic deathspiral on the offer price.